My life has taken many paths, some purpose driven, most by divine intervention. As a western trained 1981 graduate of the University of Florida College of Veterinary Medicine, I followed the footsteps of my surgical father until fate had other plans. My first pivotal moment came in the form of a skydiving accident rendering my body virtually useless. Despite the best efforts of conventional medicine, I continued to suffer. My path took a sharp detour when I was made well by the skillful hands of an acupuncturist. With the ardent passion of a religious zealot, I began my journey with alternative medicine. Starting in 1988, I trained and obtained a degree with the International Veterinary Acupuncture Society. This brief introduction only stimulated my thirst leading to my second pivotal moment when I furthered my studies by apprenticing in Norway with the renowned acupuncturist, Dr. Are Thoresen. To this day he continues to mentor me in the art of healing. This was followed in 1990 with a homeopathic certification with the American Society of Veterinary Homeopathy under the tutelage of Dr. Richard Pitcairn. In the following year I added veterinary chiropractic with Dr. Sharon Willowby, founder of the American Veterinary Chiropractic Association. I continued mastering manipulative therapies by studying osteopathy with the late, Pascal Evrard founder of a School of Osteopathy in France, and cranial sacral therapy with John Upledger of the Upledger Institute in West Palm Beach, Florida. In 1997, I was guided by Dr. Thoresen to help my own species by obtaining a degree in “human” acupuncture in the Five Element tradition; studying under the late J.R. Worsely, father of Five Element acupuncture in England. With this degree, I added humans to my list of patients to be seen in my practice. Dr. Thoresen also opened my eyes to my current passion, the study of Anthroposophy, a pathway to the true nature of selfless love as part of my understanding as a healer. My third pivotal moment was marked by meeting Dr. Paul Herscu. After training with a half a dozen human homeopaths, I finally discovered the teacher that opened my eyes to a clear and comprehensible perspective on this amazing and profoundly curative modality. He has inspired me to be a dedicated practitioner of this humbling art; I shall always be grateful. My practice is quite eclectic to say the least. My waiting room is filled with all creatures great and small and as God does, I also love them all. My family consists of three beautiful daughters, Katlin, Qi, and Sky as well as my husband Larry Miller. 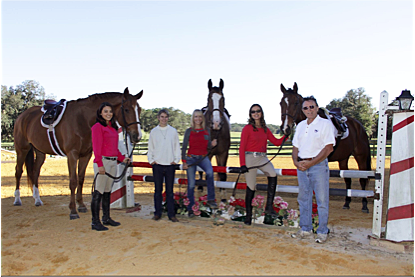 Enthusiasts of both airplanes and horses, we enjoy riding and competing with our mounts, as well as flying in and out of our 100 acre horse farm in central Florida horse country. Peggy took the NESH Two Year Course in Amherst, MA (2004-2006) and at our animal focused course in Dade City, FL (2005-2007). From 2008 to present she has continued to be a frequent participant at Clinical Classes for NESH alumni both in Amherst and at veterinary focused weekends at her clinic. • Owner and operator of Florida Acupuncture Center, founded in 1990. A facility located on my 100 acre horse farm is a place for both people and animals to be treated in various alternative medical modalities. • Founder of the Institute of Alternative Veterinary Therapies. A three year school dedicated to training students in Traditional Chinese Medicine, Classical Homeopathy, And Osteopathy. 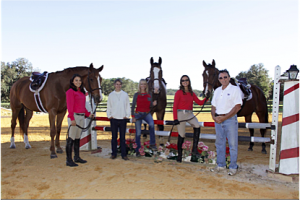 • Instructor for the International Veterinary Acupuncture Society in Equine Acupuncture. • Co-author of Veterinary Acupuncture, Ancient Art to Modern Medicine, And Veterinary Alternative Medicine published by Mosby. • Author of Atlas of Equine Acupuncture Loci. 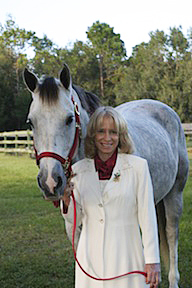 • Lecturer on equine acupuncture in both America and abroad. Peggy is our December 2017 Featured Alumna. Return to NESH Alumni Spotlight page to learn about other distinguished NESH alumni.